That’s a buff looking Shield Knight! Shovel Knight will be released on the Nintendo Switch. The popular platformer is also getting a slew of additional modes as well as new name and price. Yacht Club Games outlined their plans in a blog post today. 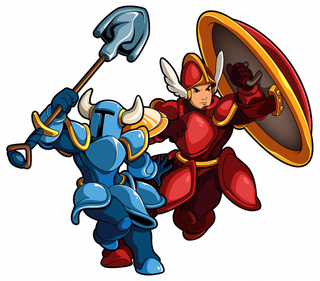 Shovel Knight will be updated into a new version called Shovel Knight: Treasure Trove. Players who own the original title will have their copy upgraded to the new version for free. It will contain the main game, the Plague Knight campaign Plague of Shadows, and the new Specter of Torment campaign featuring Specter Knight. After the upgrade to Treasure Trove, new players who did not own the game will be able to purchase previous campaigns separately or as a bundle. The game’s price will also be increasing an unspecified amount in the Spring. If the restructuring seems confusing, that’s because it kind of is. Less confusing and far more welcome are the upcoming additions to the game. A gender swapping Body Swap Mode will change the genders of characters like Shovel Knight and Shield Knight. Co-Op mode, previously an exclusive to WiiU users with Shovel Knight amiibos will also be coming to all platforms.